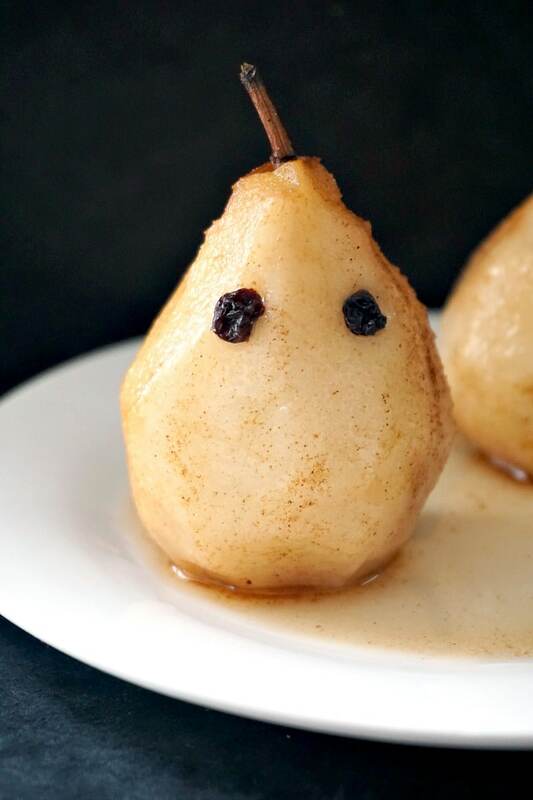 Oven-poached pear ghosts with cinnamon and maple syrup, a healthy Halloween recipe that will go down a treat with the whole family. Halloween is just around the corner, and shops have been invaded already with anything Halloween, from dressing costumes, masks, spooky decorations, and cookies, cakes or all sorts of treats. Kids are delighted, no doubt about that, to see all those sugary candies and sweets that they can fill their baskets with. But how about a healthier treat that little ones can enjoy? 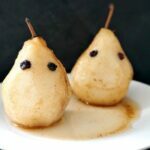 These pears are absolutely delicious, poached in the oven in a nice cinnamon and maple syrup, with that Fall touch we all love. Even babies can have their own Halloween party treat; I actually made this poached pears with my little one is mind. The little monkey is already 7 and a half months old, and such a foodie. She would eat pretty much anything, and I so want her to enjoy healthy food. I’ve been rambling on countless occasions on how fussy my older daughter is, feeling her healthy food can be a task. So, having a baby who does’t fuss just yet is such a relief. At least someone enjoys mummy’s cooking. Poaching is usually done on the stove top, but I find that the oven works even better. All you need is some kitchen foil to cover the pears, so that they can cook nicely. This also reduces the cooking time by quite a lot. The pears l had were ripen already, so they only needed 20 minutes in the oven. But if you have pears that are not too juicy, increase the time by 15-20 minutes. The pears should be soft, but still holding their shape nicely. If you don’t have maple syrup, feel free to use any other syrup or honey. If you do cook for a baby who is under one year old, do not use honey, as this can cause infant botulism. If you only cook them for adults, you can also throw some booze in, wine works particularly well with pears and cinnamon. The pears can be served either warm or cold from the fridge, and should be stored in the fridge if not consumed in the same day. 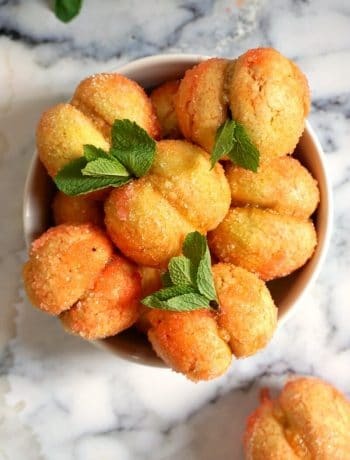 Make your Halloween party as fancy as you like, with healthy and not so healthy treats, after all, it’s one of the most awaited day of the year. For the not-so-healthy category of treats, I have these amazing red candy apples who are some great trick-or-treat goodies. 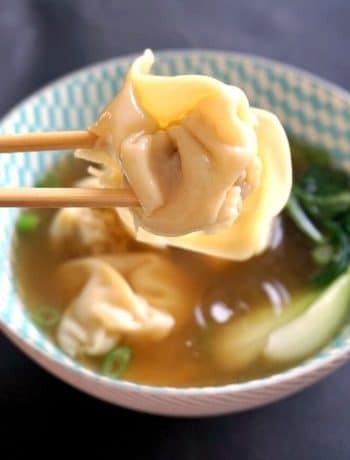 They are super easy to make, and look fantastic. What is your favourite Halloween treat? Will you throw a big party this Halloween? I am not quite a party animal, but love the Halloween-themed ones, they are so peculiar, and worth investing in a spooky costume. I have a nice Vampire girl costume, I cannot wait to wear it again. 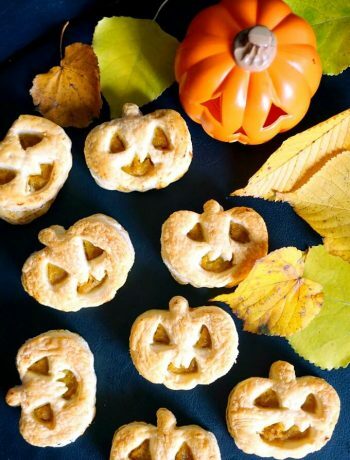 So, enjoy these very yummy ghosties, and have a fabulous spooky Halloween party! If you’ve liked my OVEN-POACHED PEAR GHOSTS or any other recipe on the blog then don’t forget to rate the recipe and let me know how you got on in the comments below, I love hearing from you! You can also FOLLOW ME on FACEBOOK, and PINTEREST to see more delicious food and what I’m getting up to. 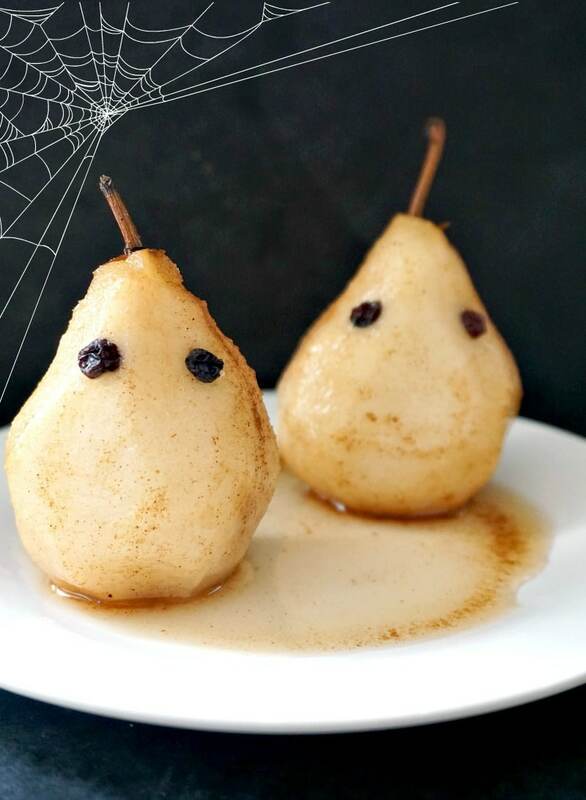 Oven-poached pear ghosts, a healthy Halloween recipe that will go down a treat with little and big ones. 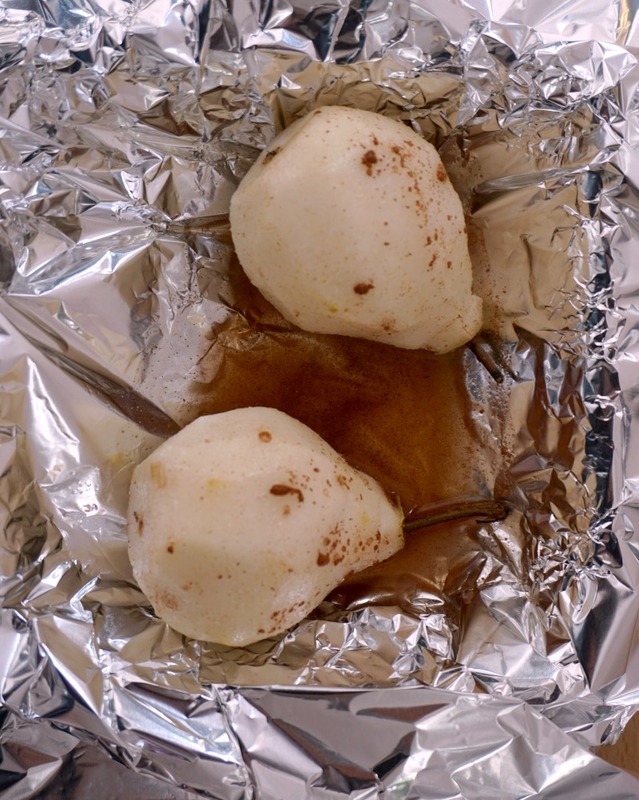 Peal the pears, line an oven-proof dish with kitchen foil, and place the pear onto it. Mix the water with the maple syrup and cinnamon, drizzle it over the pears, then cover with foil. Bake for 20 minutes until tender, but still holding their shape. Decorate with raisins or any other dried currants. Serve warm or cold. Depending on how ripen the pears are, you might need to increase the cooking time from 20 minutes to 30-40. The pears should be soft, but still holding their shape. Maple syrup can be replaced with honey or any other syrup.